When you’re out and about in the community here are just a few places that you can find ICOM Canada. 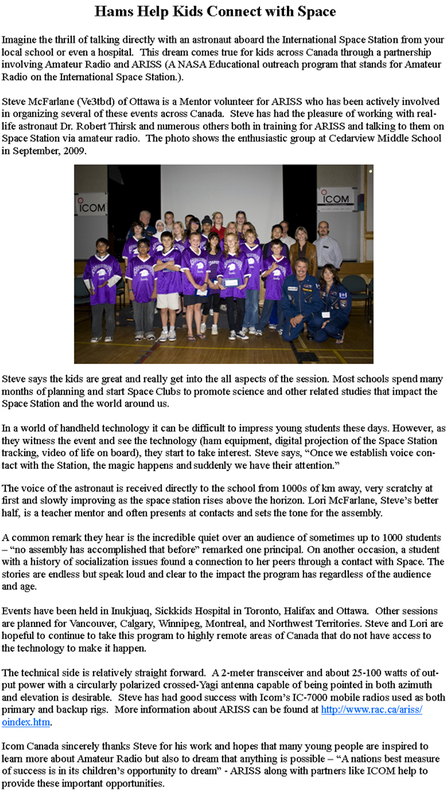 HAMS HELP KIDS CONNECT WITH SPACE! new! CEZAR TRIFU DOES IT AGAIN! VO2A is a special callsign for commemorating the UN’s International Day of the World’s Indigenous People. On this occasion, Cezar Trifu (VE3LYC) and Ken Frankcom (G3OCA) operated from Finger Island (NA194 and NF-073) on August 5-6 and from Paul Island (NA-205 and BF-74) on Aug 7-9, 2008. This was the first time both of these islands were on the air and the second activation of these IOTA groups in about 13 years. A total of about 1700 QSO’s were made from each island. These details, however, don’t do justice to the real accomplishment of these two dedicated amateur radio operators. Just getting to this remote location was a challenge. To begin with, the base in Nain is the northernmost community in Labrador and home to about 1200 people. Because of the logistical concerns and the potential presence of wildlife, especially black and polar bears, a local guide, Paul Fenton, and his two dogs accompanied Cezar and Ken. It turns out that the most dangerous creatures on these islands were much smaller. The first station was set up on Finger Island after a helicopter lift. A bear fence needed to be set along with the antennas before operation started. Rigs consisted of an Icom IC-7000 (Cezar) and a Kenwood TS-50 (Ken), with 100W power and vertical multi-band antenna wires on 10 m fiberglass masts. The original plan was to broadcast simultaneously with operations set up 30 – 40 m apart. Unfortunately tests showed that the TS-50 was affected by radio interference and each rig was operated alone. With only one rig on the air, the pressure mounted. It took only a few calls to be faced with a large pile-up, which continued all night. Cezar’s most rewarding moment on 30 m was when VK and ZL stations came in. Along with 30 m CW, 20 m SSB, 20 m CW, and 40 m CW bands were worked. Similar activity followed on Paul Island that was reached by boat. Their logs show that from each island they made about 1700 QSOs with stations in six continents, logging 2200 different stations from 63 DXCCs. Two thirds of these contacts were in CW. The QSO distribution by continent was EU 59%, NA 34% and AS 6% from NA-194 and EU 41%, NA 51% and AS 6% from NA-205, while other continents shared the remaining percentage. Oh yes, back to the most dangerous creatures. The mosquitoes on Finger Island were merciless. However, the black flies on Paul Island were not only merciless, but also vicious and dangerous. Cezar suffered from significant swelling under both eyes. Icom Canada solutes these two brave souls and congratulates those operators around the world who were able to complete these unusual and elusive QSO’s. Ken Frankcom (left) and Cezar Trifu ready for the airlift to Finger Is. Radio operators’ tents on Finger Is. Guide’s tent is in center. Cezar working JA/JS stations on 20 m CW. Cezar, Ken and Henry (boatman) ready to go to Paul Is. Ken has the first QSO from Paul Is. on 20 m SSB. Icom’s IC-7000 was the workhorse for the operation. ICOM Canada attended the midnight gala; a fund raising event hosted by the Delta Hospital which raised funds to upgrade their Opthamalic equipment. The new equipment ensures safe, efficient and successful cataract replacement surgery for cataract extractions. In recognition of ICOM’s generosity the Delta hospital has mounted a plaque in their hallway. Thanks to ICOM and other sponsors our community’s vision just got a whole lot clearer! Take me out to the ball game, take me out to the crowd…. 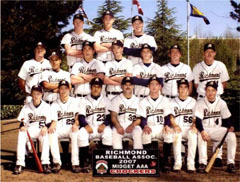 is what ICOM has been doing for the past three years by sponsoring the Richmond Chuckers baseball team. This season the team placed fifth in their league with 22 wins and 13 losses. With high hopes of placing in the top 5 at the provincials, their season came to a screeching halt getting knocked out in the first round. Coach Jason Wegwitz, former NCAA Division II college baseball player, was pleased with the team’ s overall season. “They all played well at the provincials, the games were close it was unfortunate that we just couldn’t get the breaks we needed”. For the second year in a row, ICOM Canada has sponsored the Summer Pond Hockey Team. The SPH is a community drop in team that plays at Planet Ice and after games can be found at the Three Parrots Pub in Coquitlam every Wednesday night. 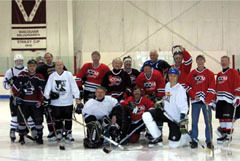 The players range in age from 20-60 years and their skill level ranges from expert to beginner. The team’s star player Donald McNair Harrison (aka Donny Boy) has been with the team since it’s debut in 2006. He played junior hockey for the Vancouver Nats, the Flin Flon Bombers of the Western Canada Major Junior Hockey League and he played in Germany for 4 years. His infamous legendary hockey tale is when he played junior hockey on the Vancouver Nats against the Calgary Centennials. Donnie ended up scraping with Calgary’s notorious Bob Nystrom, who went on to win four NHL Stanley Cups with the New York Rangers. When Nystrom played in the NHL he was renowned for being the best fighter. Donnie's legendary fight lasted exactly one punch. Nystrom tagged him on the beak and Donnie went down for the count, lights out! There may be a vast range in age and skill on the Summer Pond Hockey Team but there are a few things that connect everyone: they all get along and love to play hockey. Most of all it is good fun, great exercise, and keeps many of them thinking they are younger than they really are!